Last couple week’s I wanted to make a creamy curry recipe but was just being lazy. As I consume more vegetables than rice, I am constantly looking for variations in my recipes. But most often I windup making cabbage soup. 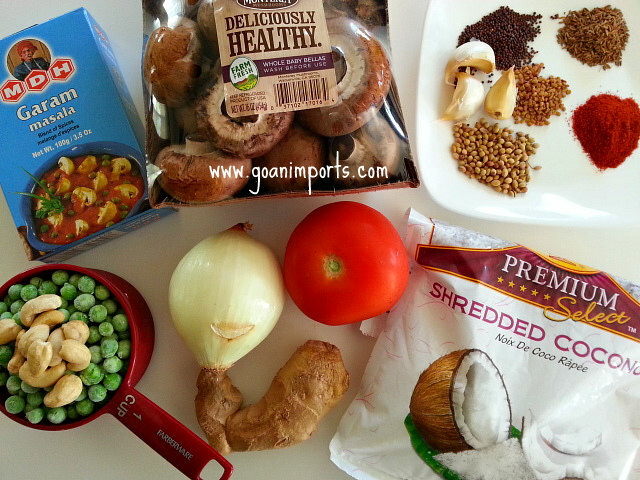 So searching online I came across a south Indian Mushroom and Pea’s Recipe that I altered to my taste and made it more efficient. This recipe calls for first sauteing the vegetables separately and then cooking it in the curry. Secondly the curry is made by grinding coconut and cashews, I added some heavy cream towards the end. The cream tones the spiciness if you do not like spicy foods. 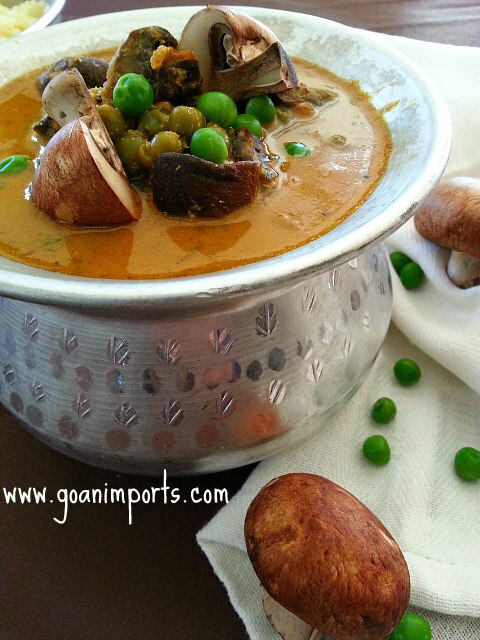 Also as and Indian we love pasta but with a tad bit of spice, this is another way you can use the creamy Mushroom Pea Curry. Wash the mushrooms and cut them into quarters, length wise. Grind coconut, ginger, garlic and cashews to a paste, keep aside. Heat oil in a pot and add the mustard, cumin and fenugreek seeds till it splutter. Next add the chopped onions and saute till soft. Follow with chopped tomatoes till they soften then add the turmeric, chili, garam masala, coriander powder and saute for 1 to 2 minutes. Next add the ground paste, saute for 2-3 minutes. Add the water, salt and sugar cover and bring the curry/gravy to a boil. Finally add the peas and mushrooms, check on seasoning and cook on medium heat for 10-15 minutes covered. Finally add cold heavy cream for the last-minute or two. Garnish with curry leaf or fresh chopped cilantro/coriander. Enjoy with plain rice, roti or bread. Oops! That was liking my site, not linking. Sorry, it got sent before I had a chance to fix the typo! I love curries and your recipe sounds very yummy. I once used fenugreek seeds in my curry and it gave it an off taste almost bitter. Maybe it was because I ground it first. Will try this recipe and leave it whole this time :). I checked some of your recipes and everything looks so mouth watering. Thanks for linking my site so that I could find yours! 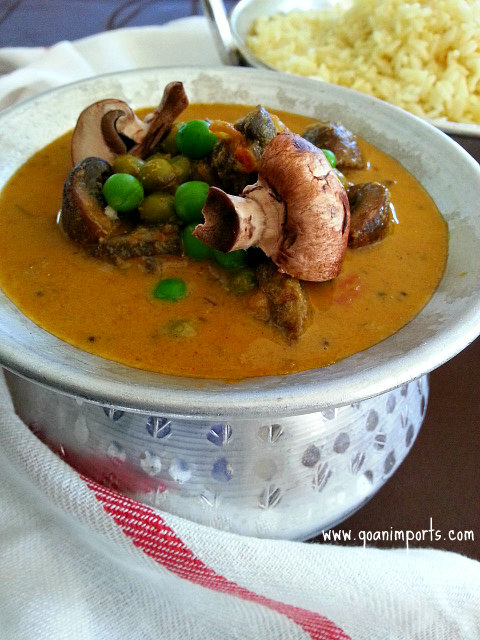 Your recipe for Curried mushrooms and Peas is intriguing. I’ve learned from the gourmet chef who is the co-author of my cookbook that you can make your own curry, but I’ve never seen a specific recipe. I love curry, and am definitely going to try this. thank you for all your creativity! Me too. I have been on the computer for too long 🙂 Thank You Stephen! Hi Nandini, this looks a pretty good dish. I guess I am gonna try this one home. Cheers!! Beautiful Nandini, I’m sure the cashew nuts and the coconut gave this curry a nice depth of flavor, and there’s nothing like a good vegetable curry is there? Your photos are lovely too. OMG, this looks so good!!!! That’s a delicious curry , Nandini! loved the flavors! I love this curry Nandini -sounds so tasty! Hi Nandini, yet another great recipe from you 🙂 This sounds like a very interesting and tasty dish. Hope you are having a wonderful weekend. Oooh… I love mushrooms. This looks so delicious! Hugs. What must I say, that is the question, PLAYING ON MY MIND. I am SIMPLY running out of words. I think I will put it this way. First and foremost Your presentation and photo shots look INCREDIBLE as always. It goes without saying that this dish would taste as good as it looks. I like the fact that You consume more veggies than rice. I think in the process You are SETTING GOOD EATING HABITS TO ALL OF US. As the saying goes, YOU GOT TO LEAD BY EXAMPLE.. In British society youngsters these days are not interested in vegetables. They are into eating JUNK FOOD and DRINKING FIZZY DRINKS. In other words their eating habits are going DOWNHILL. BRITISH MEDICS go to the extent of saying that the youngsters of today will DIE BEFORE THEIR PARENTS and maybe even before their grandparents all because of the kind of food they tuck in and that’s kind of FRIGHTENING. Now coming back to Your dish, We will give it a go very soon. My spouse likes anything to do with MUSHROOM,S, She could live on them. So I am looking forward to Nandini’s magic on Our lunch table this sunday. HURRAH! Sunday meals are taken care of. What more could I ask for? I’m lactose intolerant so I have to watch my lactose intake, otherwise I suffer. Nothing life threatening, but! The good news is that there is lactose free cream readily available. Curries are always ambitious projects for me so I might not get to this for a while. But I really like the look of this so I will do at some point. Thank you. And the same to you, your husband and your daughter. Sorry, yes I did mean sons rather than daughter! I am embarrassed now. Thank you 🙂 Wishing the same to you! Always look forward to your recipes Nandini 🙂 Great one! A great combination of flavours. Now I’ll have to buy some mushrooms. 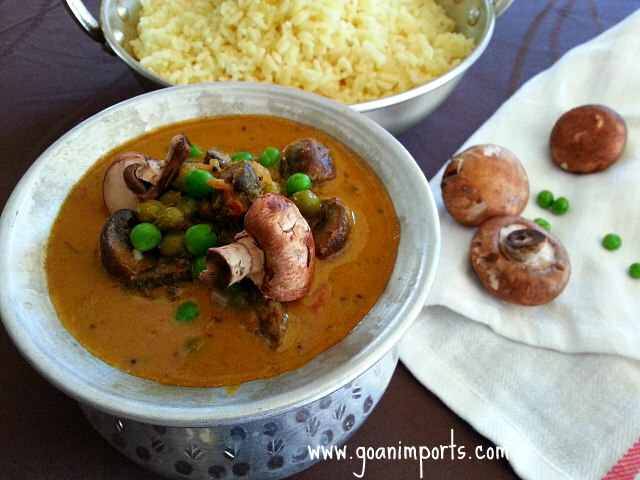 Love mushroom and pea together. Great combination! Looks delicious! And perfect for cold weather too. This sounds wonderful!!! I can’t wait to make it. I just made a curry butternut squash soup with coconut milk and a little cream. I love mushrooms and peas!!! How are you doing? Well I hope! Thank You Darryl so much…yes 🙂 Have a great weekend. It sure is 🙂 I will look forward to you sharing a recipe soon….should I say 🙂 Have a great weekend. Exceptional photos! You have inspired me to try this. Very nice! Full of flavors that must be amazing! !